GVEC offers three ways to report outages. However, using TextPower is the most convenient way because it enables you to contact us by cell phone text message. 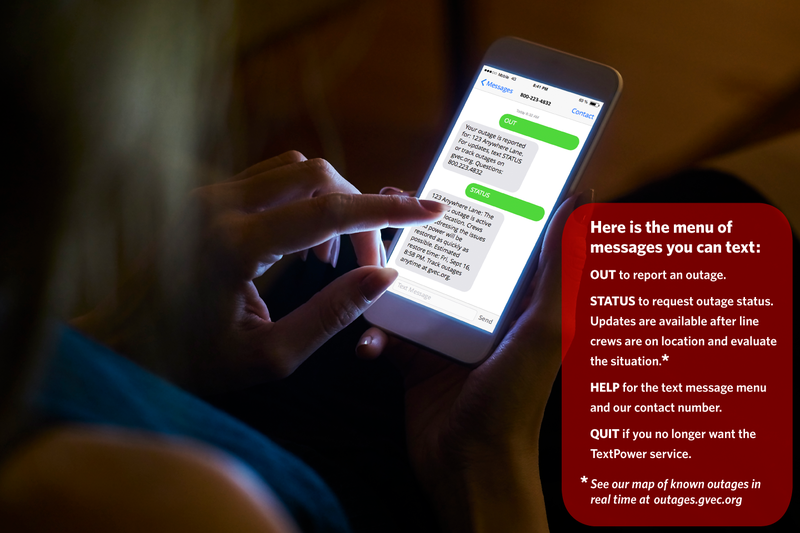 When you have an outage, just text OUT to our phone number, 800.223.4832, and we’ll know who you are and your service location. TextPower also allows you to request a status update and receive notice when your power is restored. This service from GVEC is free, although messaging and date rates from cell phone providers may apply. Save GVEC as a contact in your phone: 800.223.4832. Take a photo of the text message menu and save it on your phone for reference. Keep your contact information current. Update your account information via the SmartHub® self-service portal on gvec.org (not through the SmartHub app) or call us for assistance. To make it easy for others in your household to report an outage, up to three cell phones can be registered. Text STATUS to get an update. Updates are available after line crews are onsite and evaluate the situation. Text HELP for the text message menu and our contact number. Text QUIT to opt-out of this service at any time. 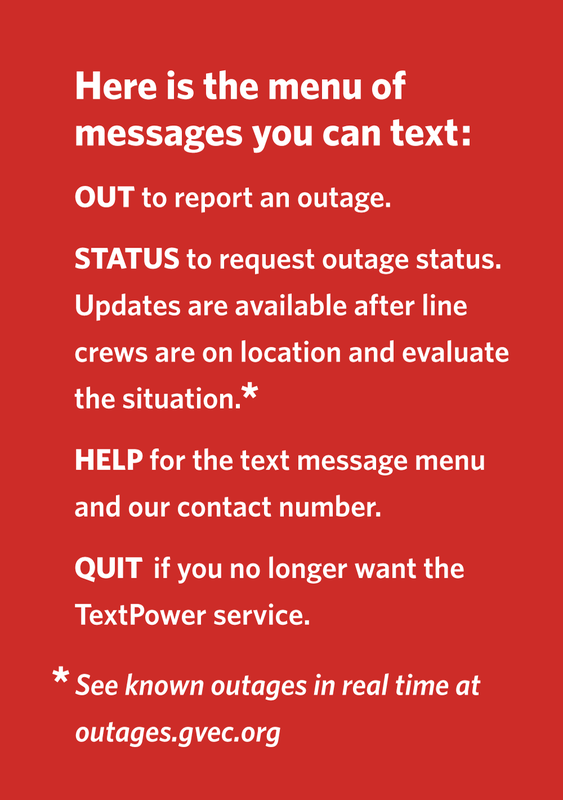 When power is restored, we’ll send you a text. However, if your power isn’t on, text OUT or call us right away at 800.223.4832. View our map of known outages in real time. This service is free from GVEC. However, depending on your cell phone provider plan, messaging and data rates may apply. For questions or to sign up, call us at 800.223.4832. Call us: 800.223.4832. Have your meter number, account number, service address or phone number on the account ready. Whether you talk to a Customer Service Representative or provide your information through our automated phone system, your report is immediately logged into our system so we can respond. The GVEC Control Center is in operation 24/7.